You are currently browsing the archive for the Prince Edward Island category. Enough of fog and rain and cold. I’m joining a planeload of Canadian Snowbirds winging our way to Jamaica for a little sunshine and some honest fish jerk. But some of you asked if I couldn’t get Duncan Smith’s award-winning chowder recipe. Duncan was too busy sucking up a Molson or two while celebrating his victory to lucidly give me the recipe but his boss at the Claddagh Oyster House in Charlottetown, Liam Dolan, graciously passed it along. 3 lbs. 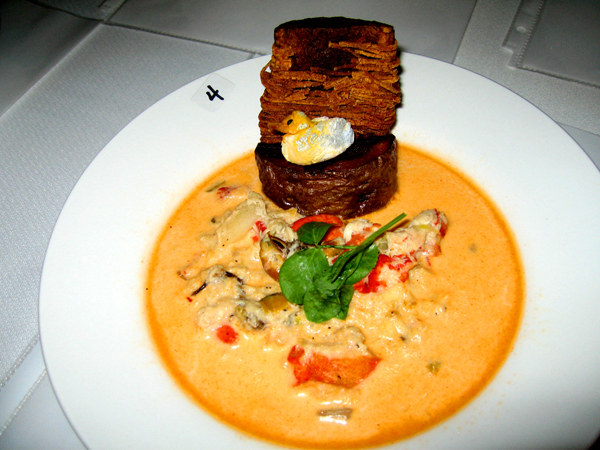 of chowder fish, including any combination of halibut, haddock, salmon, scallops, lobster, crab, mussels, and oysters. Place butter in pot over low heat and melt. When butter begins to foam, add onions, celery, carrots, and red peppers and gently sauté until onions are translucent but not browned. Add flour and cook roux for 5 minutes, stirring constantly. Add potatoes and milk or cream in increments, bringing the mixture up slowly, never letting it boil. Put fish in a pot and put enough water in just to cover and poach for 4 or 5 minutes—just until cooked through but not rubbery. Steam shellfish (adding garlic, white wine, and thyme to pot if so desired); reserve juice and add to poached seafood liquid after removing fish. Add seafood and shellfish to milk mixture along with fish stock and bring to a simmer. Add Triple Sec and taste for salt and pepper. Garnish with chopped chives. Who makes the best seafood chowder? I’ve pulled Raspberry Point oysters out of the bay and shucked them on a barge, downing them with sips of Cloudy Bay sauvignon blanc straight from the bottle, and shivered on a boat out on New London Bay taking in the scene as heavy socks of PEI mussels were pulled up from murky green water. But I came here to be a judge for the island’s potato seafood chowder competition and by god, it’s time to eat some chowder. So late this afternoon I walked down to the festival site, a big white circus tent along the Charlottetown waterfront, where a group of young girls were performing some sort of an Irish clog dance disconcertingly to country music. I found the check-in point for the judges and was hustled backstage to where the organizers had set up linen-covered tables in a horseshoe. All the other judges, including the competition leader, Hans Anderegg, a Swiss-born chef who’s been an instructor at the Culinary Institute of Canada since 1988, were already here and didn’t look too pleased at my slightly-late arrival. Hans gave me a rules sheet and told me to quickly look it over. Hans smirked and shook his head in disgust. Okay, evidently there are rules for making chowder. Like the chowder must contain only Prince Edward Island shellfish and seafood (makes sense) and is restricted to flounder, trout, haddock, cod, hake, soft shell clams, oysters, mussels, quahogs, lobster, scallops, halibut, salmon, and snow crab. Also, the “registrant’s chowder must contain Prince Edward Island potatoes.” And be a traditional milk or cream-based chowder. Well, nothing too unusual there. Then Hans handed me a score sheet. I was to rate each chowder for flavor (20 points), consistency (10 points), appearance (10 points), and overall appeal (10 points). The last category seemed a little redundant to me (wouldn’t its overall appeal be determined by the flavor, consistency, and appearance? ), but what the hell did I know. Hans was in charge of the competition, not me, and Hans was from Switzerland so we would do it his way, jaa? The orange glow in this chowder comes from an abundance of curry. The brown thing in the back is a whole potato stuck upright in the soup. Needless to say, this is not the winning entry. Four or five waiters appeared out of nowhere and gave us each 10 soup spoons, a plastic bottle of water, and two paper cups. “Where’s the wine?” I asked. Fortunately, there was a murmur of consent amongst my fellow judges. Hans conferred with a tall, somber woman dressed all in black and minutes later, two bottles of very bad chardonnay were brought to the table. Oh, well. Better than nothing. Before I could condition my taste buds by taking a sip or two, the first round of chowders were brought to the table. Is it possible to make a bad seafood chowder when you’re using exquisitely fresh PEI shellfish and fish and island potatoes? It is. This was ghastly. The chef’s secret ingredient, a spritzing of whisky, was cloying and overwhelmed the bombed over mussels and clams. I generously awarded it 27 points out of a possible 50. There were other miscues. The roux for one chowder tasted like Elmer’s glue and wedded my spoon to the bowl. Another had so much curry in it I was forced to drink two glasses of wine just to flush my taste buds. Do we really want whole squash blossoms in our seafood chowder? I think not. But they weren’t all bad. 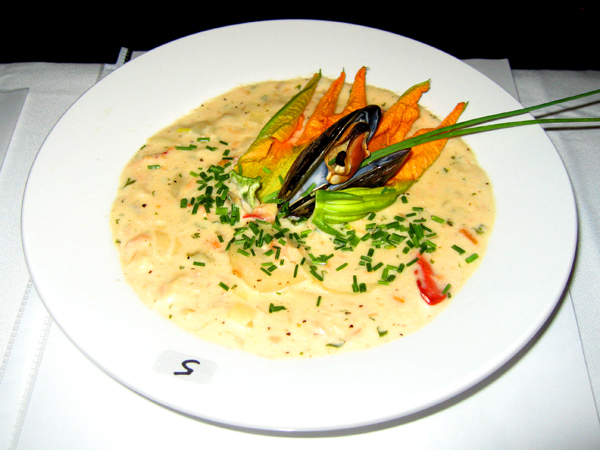 One perfectly balanced chowder was delicately spiced with paprika chili oil, giving the milk base just a little heat, and another showcased the island’s mussels and scallops along with big chunks of perfectly poached lobster. In the end, the consensus winner was a recipe titled “Just Like Dad’s Seafood Chowder” with its simple base and a generous sampling of all the good things that come from PEI: halibut, haddock, salmon, scallops, lobster, crab, mussels…and, of course, oysters. It was made by Duncan Smith. Who just happens to be the executive chef at Liam Dolan’s Claddagh Oyster House. Leave it to someone named Duncan to come up with the perfect seafood and potato chowder. Now if only the wine had been half as good. Can you eat too much shellfish? Well, Sonia, yes I do. I do eat a lot of shellfish. In fact, I think it’s safe to say that any time I have an opportunity to have a marine mollusk or two—whether it be oysters, clams, mussels, scallops, cockles, periwinkle, or geoducks—I’m going to Just Say Yes! Take yesterday, for instance, when Stephen Steward, who runs a little company called the Confederation Cove Mussel Company, which processes and exports about 200 million mussels every year, offered to take me out onto New London Bay where the company has 1,500 acres under production to show me how they grow. 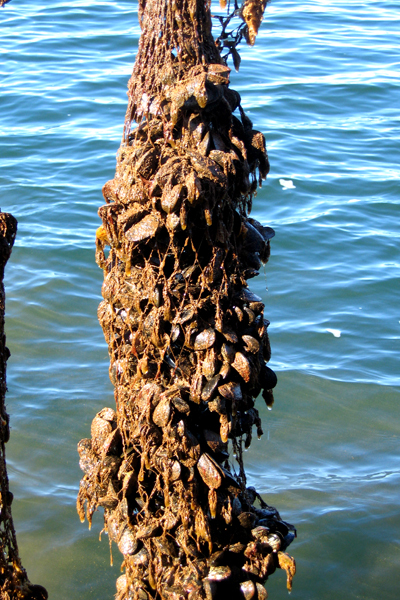 A mussel sock with 25 pounds of bivalves growing in New London Bay. Photo by David Lansing. Frankly, it’s all kind of boring so, lucky you, I’m going to condense my three-hour tour into a couple of sentences. First off, they get what’s called a mussel sock and fill it with thousands of seed mussels. Then they hang about 400 of these mussel socks along 600 feet of line across Confederation Bay. They do this so the mussels are free of sand and mud from the bottom and have easy access to their favorite meal: plankton. Two or three years later, the mussels are all grown up and the socks get pulled off the lines and sent to an enormous warehouse where they’re cleaned and sorted by size. The mussels Confederation Cove I watched being harvested yesterday morning were processed and shipped later that day to JFK or Logan and then, overnight, flown all across the U.S., arriving the next afternoon, for instance, at a restaurant in San Francisco or Los Angeles, which is pretty amazing when you think about it. Fortunately, I didn’t have to go to L.A. or even New York to sample some of Stephen Steward’s mussels. 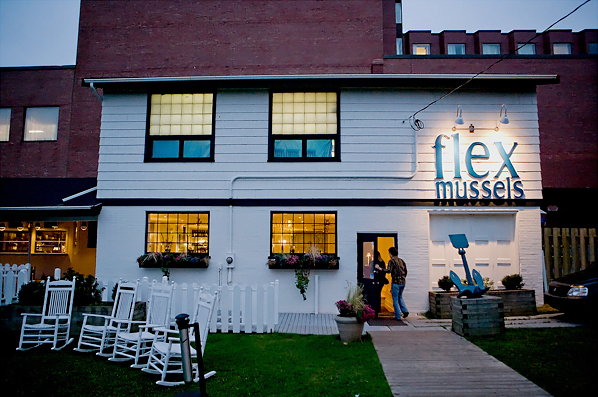 Instead, last evening we went to Flex Mussels, a tiny, cedar-shingled restaurant owned by a New Yorker who thought it only appropriate that the island that exports 80 percent of all the cultured mussels in North America should have a spot pretty much dedicated to the little buggers. Now this is where Sonia comes in. Because when you are on an island known for their mussels and dining with a man who makes a living growing millions of the little suckers and he takes you to a restaurant specializing in the bivalves, well, you’re probably going to eat more than your fair share. Photo by Chris Ramirez. Check out his other great photos at www.ramirezpix.com. Because Flex doesn’t just do the classic French “mussels-in-white-wine-and-herbs” dish (although they do do a nice version of that). They serve mussels with prosciutto and caramelized onions; with lemongrass, coriander, and ginger; Indian curry, star anise, and cinnamon; and basil, pinenuts, and parmesan. And that’s just to start. There’s a Mexican version with chipotle adobo, a Jamaican dish with hot peppers and rum, and a Spanish adaptation featuring chorizo and green olives. You can get mussels with sake and pickled ginger, smoked bacon and mushrooms, and country ham and bourbon. And, of course, Stephen thought we should try them all. Or at least as many as we could. And I’m here to say that we got through all the ones I’ve already mentioned. But there were at least a dozen we didn’t try. It’s cold and rainy and way too early in the morning. Which is why the first thing I do at the Charlottetown Farmers’ Market is follow the smell of freshly roasted coffee coming from the Caledonia House booth, the only real coffee roaster on the island. Everyone seems to have the same idea; the line is 12-deep. I am so jonesing for something muddy and dark and hot that I consider offering to buy the latte of someone ahead of me in line if they’ll get me one too. But that would just be wrong. Wouldn’t it? Once I get my coffee (ah, Jesus, the first sip is both lovely and calming), I’m able to relax a bit as I stroll down the busy lanes of the indoor market. The smells are luscious but confusing. There are pasty looking pierogis, cooked in an ancient electric skillet, at Grandma Jaworski’s, as well as spinach and chick pea chowder at Eat Well Foods. Home-fried potatoes are sizzling in a skillet alongside a Dutch oven of corned beef hash. A young girl in a tie-dye shirt is handing out samples of banana bread while two little girls, no more than four or five, sit in the middle of the aisle sharing a plate of rice and stir-fried vegetables. Paul Offer at his farmers' market booth in Charlottetown. Photos by David Lansing. The busiest guy at the market must be Paul Offer of The Doctor’s Inn. 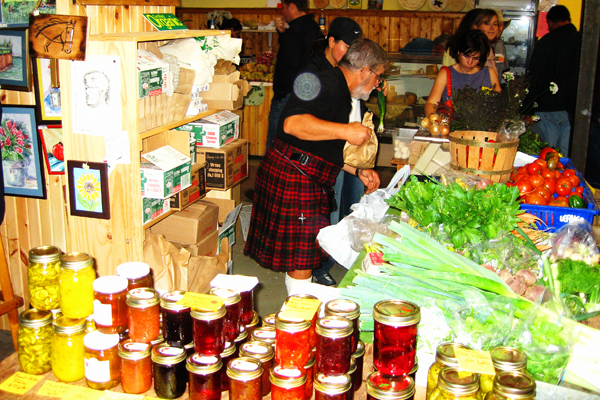 Dancing around in a tartan kilt, he hustles to weigh a bag of giant peaches for one patron while grabbing a jar of home-canned bread & butter pickles for another. On an L-shaped table are jars of peach conserve, pickled beets, rhubarb marmalade, black currant jam, and cranberry sauce with Cointreau, all for about $5 each. A couple of booths over is a middle-aged woman with rosy cheeks holding a bushel basket of what looks like baked potatoes. 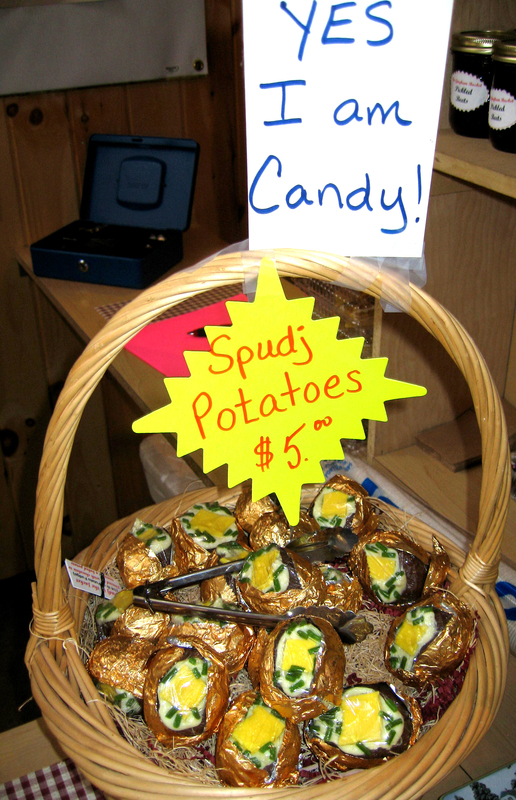 The small spuds, wrapped in gold foil, are dressed with sour cream, chives, and a big pat of butter. Does this look like candy to you? Except these aren’t really spuds—they’re spudj, a type of fudge made from potatoes by Mary Capper. So how does it taste? Pretty much like fudge, I guess, something I’ve never been overly fond of (I don’t like the way the intense sugar makes you want to grind your teeth from the sweetness). What I want to tell her–but don’t–is that there’s probably a good reason for that. Don’t you think? You don’t want to go toe-to-toe drinking Guinness with Liam Dolan. After all, in addition to owning the Claddagh Oyster House in Charlottetown, he’s also the proud proprietor of the Olde Dublin Pub where, last night, he stood me to a pint or two…or three. 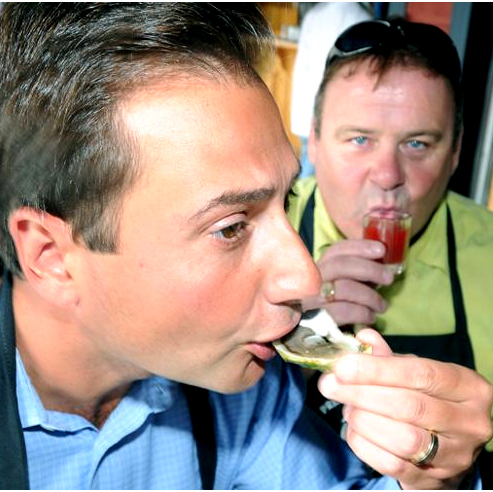 A customer samples oysters under the gaze of Liam Dolan, owner of the Olde Dublin Pub. Photo by Heather Taweel. “Well,” said Liam, “I would have taken him up on the bet but I was workin’. But nobody else showed any interest. In fact, Paddy, who I thought for sure would take up the bet, actually left. Very disappointing. By the way, I got a couple of comments yesterday regarding my inquiry into who came first to PEI—the Irish or the potato. So now we know: First the spud, then the Irish. Followed shortly thereafter by the Guinness, no doubt.